PETALING JAYA (Oct 6): E-commerce will not replace shopping malls because both models need each other to survive, said Retail Group (Malaysia) Sdn Bhd managing director Tan Hai Hsin. “Will e-commerce replace shopping malls? The answer is ‘no’. Not in this lifetime. In fact, e-commerce [and] malls need each other to survive due to the strong demand for both shopping methods. The future shopping experience trend is a mix of both, but not either one,” said Hai Hsin. Other speakers of the session include Sunway Malls and Theme Parks chief operating officer Kevin Tan, Aladdin Group senior vice-president Datuk Sri Vincent Tiew, Malaysia Retail Chain Association Datuk Garry Chua and eOneNet.com CEO Fione Tan. The moderator of the session was Area Management Sdn Bhd executive chairman Datuk Stewart LaBrooy. Hai Hsin, however, did not deny that some areas in Malaysia, particularly in the Klang Valley, have more shopping malls than what the local market actually needs. “But generally, I will not say we are over retail. The situation is not critical like some other countries such as the US, which we have seen many malls close. There are many Malaysia strata malls that have difficulties in operating in the past 20 years but we hardly see any malls close down. However, I do agree certain areas have more malls than needed and [these areas] probably need some consolidation in the future,” he said. Another speaker, Sunway’s Kevin said that while e-commerce is growing aggressively, the contribution of consumer retail towards total transactions via e-commerce is not significant enough. “Only 10% of total e-commerce revenue is from the purchase of goods and services [by end-consumers]. Many people still prefer to shop offline for better customer services. There are still light at the tunnel for malls. After all, we [malls] are with the business of people and communication,” said Kevin. Nevertheless, Aladdin’s Tiew believes e-commerce will significantly impact shopping malls as it offers many conveniences, such as visitors being able to visit different e-commerce platforms at one time. “My concern is, do we really need to build that many shopping malls in the future when the future trend is about the online economy?” Tiew said. Some of e-commerce’s advantages over malls include low operating cost, speed and accessibility via the internet. 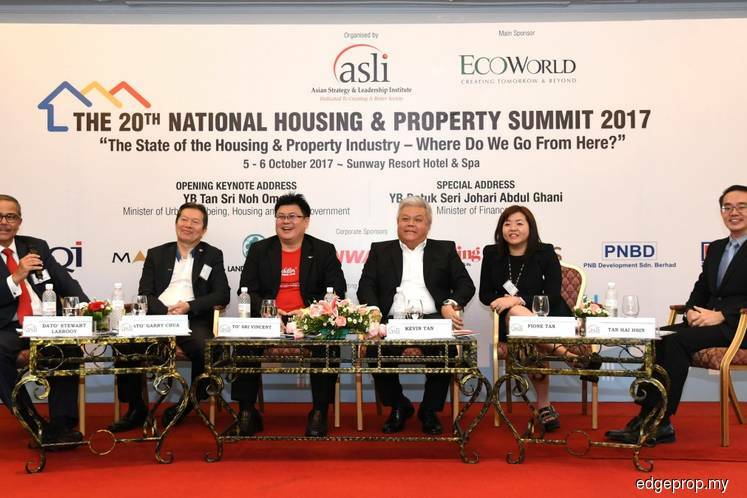 Themed “The State of the Housing & Property Industry — Where Do We Go From Here?”, the 2-day summit is organised by Asian Strategy & Leadership Institute. EdgeProp.my is the official media partner for the event.